RSS Sah Sarkaryavah Shri Manmohan Vaidya stated that the entire nation will stand and work together in solidarity with Seva Bharathi to overcome the Kerala floods calamity. For flood rescue, relief and rehabilitation operations, more than 1.20 lakhs karyakartas are at work in Kerala and have set up more than 300 relief camps. Medical camps that are being run number 250, 350 boats are involved in rescuing people, more than 75600 people have been rescued so far and transported to relief camps and 2000 tonnes of rice distributed. As part of rescue and relief operations, as on 1st September 2018, more than 2 lakhs karyakartas and seva workers have been involved in cleaning-up operations in affected areas. Shri Manmohan Vaidya was addressing a press meet at Mantralayam in Andhra Pradesh, at the conclusion of RSS 3-day national coordination meeting held there. He stated that entire society has to come together to foil the conspiracies to break-up Indian society in the name of regionalism, communalism and casteism. Diversity can never be discord (that is, diversity cannot mean discord). In our culture, we have always celebrated the festival of diversity. 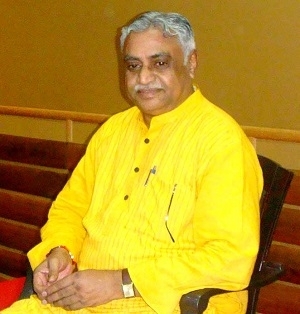 Sahsarkaryavah Shri Manmohan Vaidya stated that Sangh will accelerate the efforts to channelize the energy of youth into positive and constructive activities. He said that the RSS and all the inspired organizations will take the whole society along to establish a an awareness movement spanning across society for water conservation and environmental protection.